After the 2012 elections, there were only 26 members of the U.S. House who were elected from districts that their party's presidential candidate didn't win in the 2012 election. Nine Democrats were elected from districts Mitt Romney won, and 17 Republicans were elected from districts President Obama won. As we've previously mentioned 1, this is the lowest total after any presidential election since 1920. The fact that there's so little crossover partisan representation in the House helps explain why the parties are so polarized, as National Journal amply demonstrates 2 in its latest ratings of congressional votes. After the 2014 election, it's possible -- perhaps even likely -- that there will be even fewer crossover members of the House. A quick look at the playing field explains why. First, let's look at the nine Democratic-held Romney seats. Two of those are almost certain to flip to the Republicans because of the retirements of Reps. Mike McIntyre (D, NC-7) and Jim Matheson (D, UT-4). Additionally, Republicans have a decent shot to defeat Reps. Ann Kirkpatrick (D, AZ-1), Ron Barber (D, AZ-2) and Nick Rahall (D, WV-3), as well as outside chances to beat the four other Romney-district Democrats: Reps. Patrick Murphy (D, FL-18), John Barrow (D, GA-12), Pete Gallego (D, TX-23) and Collin Peterson (D, MN-7), particularly if any of them retire (Peterson would be the likeliest retiree). If Republicans have a very strong year, it's possible to imagine all nine of these seats flipping to the GOP -- leaving not a single Romney-district Democrat. That's probably not going to happen -- Barrow and Peterson in particular would be very hard to beat -- but it's not impossible. On the other hand, if Democrats have a good year they could add a couple Romney districts to make up for the loss of the Matheson and McIntyre seats, like very competitive but slightly Republican-leaning open seats in Pennsylvania (PA-6) and Virginia (VA-10) or some others. For the most part, though, the best Democratic targets are districts that Obama won. That starts with the district of Rep. Gary Miller (R, CA-31), especially now that Miller is retiring, according to multiple reports Wednesday afternoon. In a district where Obama got 57% of the vote, Miller won in a fluke 3 in 2012. Despite the news, we're keeping the race rated Leans Democratic, but it's closer to moving to Likely Democratic than to Toss-up. We just want to wait and see if a credible Republican runs here. Another good opportunity for Democrats is the vacant FL-13, which will be filled in a special election next month. Both sides are downplaying their own chances of victory -- unsurprising in a special election -- and some narrow polls along with high outside spending on both sides tell us it's close. We continue to slightly favor Alex Sink (D), even though we might be out on a precarious limb in doing so. Two other Obama-won Republican open seats in Iowa (IA-3) and New Jersey (NJ-3) present appealing targets to Democrats, as do two incumbent targets in Obama seats: Reps. Mike Coffman (R, CO-6) and Chris Gibson (R, NY-19). 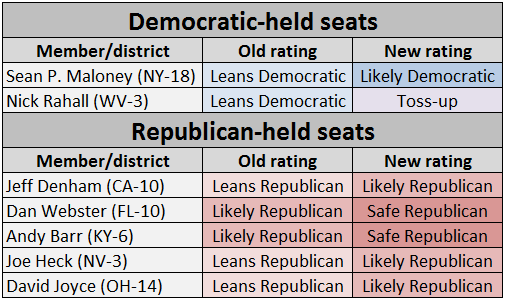 Still, even a very good Democratic year wouldn't come close to eliminating all the Obama-district Republicans: Of 17 such seats, we rate nine as Likely or Safe Republican. And if Republicans have a good year, they would invariably add some Obama seats, most likely in states such as California, Illinois and New Hampshire, where House Democrats surged in 2012. In a new forecast, Crystal Ball Senior Columnist Alan Abramowitz's House elections model 4 suggests little movement one way or the other in the House. A non-wave year would probably just result in a few more of these crossover seats reverting to their presidential preference, a trend that would reflect the country's deeply polarized politics. From a historical perspective, though, the country is not uniquely polarized in the House. Vital Statistics on Congress has presidential election data 5 from 919 congressional districts in the 1900, 1904 and 1908 elections (some districts are missing from those years). Over those three elections, in only 36 of 919 instances (3.9%) did a district's presidential and House party preference differ. By contrast, over the past three presidential elections (2004, 2008 and 2012), voters in 168 of 1,305 separate district-level elections (12.9%) picked different parties in their congressional and presidential selections. The takeaway: Those who say the country has never been more divided are overstating things, although the recent trend in polarization is very real. It seems nearly impossible that the United States will have a perfectly partisan House with zero crossover members. However, it is reasonable to expect that we will be a bit closer to a crossover-less House in 2015 than we are now. Rep. Jeff Denham (R, CA-10) -- Leans Republican to Likely Republican: Michael Eggman (D) nearly tied Denham in recent fundraising, but the incumbent has more than quadrupled the challenger in cash on hand, and given that Democrats only got within a half-dozen points of Denham last cycle, it would be a pretty big surprise if he lost. Rep. Dan Webster (R, FL-10) -- Likely Republican to Safe Republican: Last cycle, Val Demings (D) proved to be a strong challenger against Webster in this district, but she passed on a rematch and national Democrats appear to have moved on to other targets. Rep. Andy Barr (R, KY-6) -- Likely Republican to Safe Republican: Barr defeated former Rep. Ben Chandler (D) in a 2012 rematch, and likely Democratic nominee Elisabeth Jensen isn't Chandler. This just isn't a good district to be a Democrat in the Age of Obama. Rep. Joe Heck (R, NV-3) -- Leans Republican to Likely Republican: See the Denham entry above -- the logic is basically the same. Heck won by 7.5 points in 2012 and is facing a Democratic opponent, Erin Bilbray, who hasn't really distinguished herself. She's also royally annoyed 6 Nevada super-reporter/analyst Jon Ralston, which is never a good sign for a Silver State politico's prospects. Rep. Sean Patrick Maloney (D, NY-18) -- Leans Democratic to Likely Democratic: Maloney is facing a rematch against ex-Rep. Nan Hayworth (R), but national Republicans don't seem all that enthusiastic about her comeback candidacy. Rep. David Joyce (R, OH-14) -- Leans Republican to Likely Republican: In a historically Republican but swingy part of the Buckeye State, freshman Joyce is generally voting in a smart way -- his voting pattern is almost exactly in the middle of the House, according to the National Journal ratings -- and significantly outraising challenger Michael Wager (D). This is a seat, much like those of Denham and Heck, that Democrats would really like to target, but they appear to have better opportunities elsewhere. Joyce is facing a primary challenge 7, but there's no reason to expect that he won't win renomination. Rep. Nick Rahall (D, WV-3) -- Leans Democratic to Toss-up: In a move we've been considering for months, we're putting this nearly four-decade incumbent in the Toss-up category. Although Rahall is a proven commodity who is going to be difficult to defeat, the terrain he's defending -- 65% Romney -- is just very challenging even taking into account the Mountain State's local Democratic tradition, and outside Republican groups have been hammering away at him. Rahall isn't taking the challenge from party-switching state Sen. Evan Jenkins (R) lightly, raising an impressive $428,000 in the fourth quarter of last year and joining the Blue Dogs, the moderate/conservative Democratic House group. If the race were today, we'd still pick Rahall to win, but he should be in for quite a fight. The two newsiest House developments over the past couple weeks merit some comment from us, even though they do not affect our ratings. More memorable than anything President Obama said in his State of the Union a few weeks ago was Rep. Michael Grimm's (R, NY-11) truly epic meltdown 8 that evening. Grimm berated and threatened an interviewer after being asked about a lingering scandal 9 involving potentially illegal donations to his 2010 campaign. That investigation may still ultimately hurt Grimm, who is in a tough reelection battle against former New York City Councilman Domenic Recchia (D), but it'll take more than a viral video for us to move the race into the Toss-up column (we have it as Leans Republican now). After all, as many observers noted at the time, Grimm's Staten Island constituents might be more tolerant of a rough-around-the-edges congressman than most. The other House development making national news was former American Idol runner-up and pop star Clay Aiken (D) jumping into a contest against Rep. Renee Ellmers (R, NC-2) in a central North Carolina district that includes part of the Raleigh suburbs. Aiken, of course, is generating buzz because of his celebrity, but this is still a Safe Republican seat: Romney won 58% of the vote here in 2012. The seat used to be held by ex-Rep. Bob Etheridge (D), but Ellmers defeated him in 2010, and then Republicans in the state legislature made the district more Republican in redistricting. Snickers about Aiken's long odds aside, we think he does deserve some credit for running: The country needs more noteworthy candidates willing to challenge incumbents against seemingly insurmountable odds. If anything, Ellmers will have to run a little bit harder, and there are dozens -- hundreds, actually -- of other House members who could use even a mild test.